ミントとパウダーシュガー、ラムベースのカクテル　”ホタルナモヒート”、シェリーベースの”レブヒートホタルナ”、アルコールフリーの”ベイビー モヒート”の3種類がございます。A rum-based cocktail　”Hotaluna mojito”, sherry-based cocktail “Rebujito Hotaluna”, alcohole-free “Baby mojito”. 3 types are offered. イタリア最大規模のジェラート協会「SIGA」に日本で唯一「SIGA」のマークをつけることを許された高品質のイルジェラートとこだわりのエスプレッソと溶け合うホタルナ限定ジェラート。Marked by Italy’s largest Gelato corporation “SIGA”, high quality Gelato is available in limited flavors and toppings such as espresso. *Cruise time from Asakusa to Hinode is about 40 minutes. *Cruise time from Asakusa to Odaiba is about 60 minutes. *Cruise time from Hinode to Odaiba is about 20 minutes. *Cruise time from Hinode to Asakusa is about 40 minutes. *Cruise time from Odaiba to Hinode is about 20 minutes. 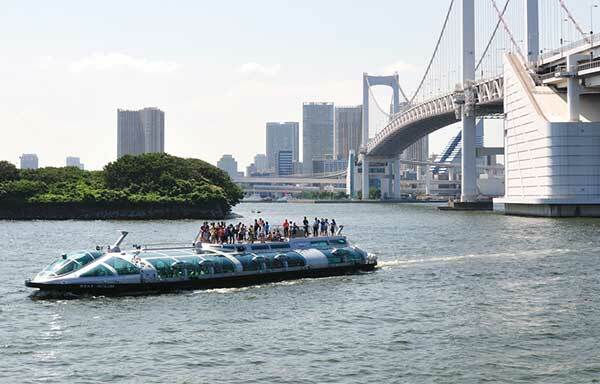 *Cruise time from Odaiba to Asakusa is about 60 minutes. ・From Asakusa Sta. (Tokyo Metro Ginza Line): 1 min. walk. ・From Asakusa Sta. (Tobu Isezaki Line): 1 min. walk. ・From Tokyo Subway Asakusa Sta: 3 min. walk. ・From Hinode Sta. (Yurikamome line): 3 min. walk. ・From Hamamatsu-cho Sta (JR line): 10 min. walk out of South Exit. ・From Daimon Sta. of Oedo (Asakusa Subway Line): 15 min. walk. ・From Odaiba Kaihin Koen Sta. of(Yurikamome line): 5 min. walk. ・From Daiba Sta. of (Yurikamome line): 5 min. walk. *Departure time may be changed without notice depending on unforeseeable weather conditions or other circumstances. *Service will be suspended for about three weeks around May for ship inspection.